Shooting for the hip: All-night culture festival shines light on Shavuot – J. Young, hip Jews looking for something to do in San Francisco might not put an all-night Shavuot study session at the top of the list. But they are more likely to come out for an arts and culture festival featuring comedian-actress Sandra Bernhard, danceable Afro-pop tunes performed by Fool’s Gold and a conversation with “The Russian Debutante’s Handbook” and “Absurdistan” author Gary Shteyngart. And those are just the headliners. Dawn, a fourth-year celebration sponsored by national Jewish nonprofit think tank Reboot and online Jewish culture magazine Tablet, will be held at the California Academy of Sciences in Golden Gate Park on May 15. Cost for the event is $20. Along with the three headliners will be an Ask the Rabbi installation (with a revolving group of rabbis), spoken word by Found magazine creator Davy Rothbart and specialty cocktails mixed by local author Daniel Handler, creator of the Lemony Snicket children’s series. Dawn 2010 also will include film screenings: “Maurice at the World’s Fair,” a short by “Where the Wild Things Are” director Spike Jonze about children’s book author Maurice Sendak; and “Hungry Hearts,” a recently re-released 1922 silent film about an Eastern European family trying to make it on New York’s Lower East Side. Veteran San Francisco musician Ethan Miller of Comets on Fire and Howling Rain composed a score to accompany the “Hungry Hearts” screening. He and a half-dozen other musicians will perform it live in the museum’s planetarium. The idea for Dawn sprang from a conversation music industry veteran David Katznelson had in Los Angeles several years ago with Rachel Levin, a Reboot founder. Katznelson, a San Francisco native who has since moved back to the city, was discussing the seemingly arbitrary nature of modern Jews fawning over a relatively minor holiday like Chanukah while more significant holidays such as Shavuot, marking the day God gave the Ten Commandments to Moses, get much less recognition. In the years since its initial, small gathering at San Francisco club Whisper in 2004, Dawn has grown to include “a whole year’s worth of programming in one event,” says Katznelson. An array of local organizations and foundations are supporting the event. The last production — Dawn 2008 — was held in conjunction with the Contemporary Jewish Museum’s opening in San Francisco. At that event, thousands of visitors packed the museum to check out author Jonathan Safran Foer and Cambodian rock band Dengue Fever. Organizers of the upcoming event are counting on similar attendance this year. The expansive Academy of Sciences was chosen as the 2010 location because the scientific theme of the museum and the religious aspect of Shavuot provide natural material for discussion and debate, says Reboot executive director Lou Cove. Related to the Shavuot theme, organizers are hoping to spark discussions of the Ten Commandments. Reboot did its part by distributing the commandments to performers, encouraging them to incorporate the 10 holy edicts into their acts. Found magazine’s Rothbart says he has some interesting ideas about how to include the commandments in his storytelling performance. His popular publication features love notes, drawings, random lists and photos found and sent in by readers. He began gathering the artifacts 10 years ago and now receives between 10 and 30 found items every day. He has received copies of angry faxes sent to the wrong numbers, heartbreaking letters from sons to fathers, hand-drawn flyers of men looking for love and hundreds of photographs without explanations. “All of these finds are incomplete; they are all little riddles that spark your imagination,” Rothbart says. When Rothbart acts out a note in his spoken-word performance, he tries to inhabit the author without any mocking pretense. He also occasionally reads aloud his own short personal essays, which have aired on “This American Life,” which is produced by Chicago Public Radio and distributed by Public Radio International. At Dawn, he’s planning to act out notes he has been sent that somehow relate to stealing or adultery — both mentioned in the Ten Commandments and both common themes in notes sent to Found. As Dawn continues to grow in San Francisco, dozens of cities have contacted Reboot to request similar events for their Jewish communities, Cove says. He thinks it’s bound to happen at some point down the road. “Ultimately, the idea is that 10 years from now, a new generation will know and understand Shavuot and have some specific rituals around the holiday because of Dawn,” he says. 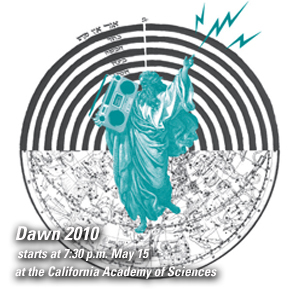 Dawn 2010 starts at 7:30 p.m. May 15 at the California Academy of Sciences, 55 Music Concourse Drive, Golden Gate Park, S.F. Advance tickets (required): $20. Ages 21 and older. For details, visit www.dawnfestival.org.